Not talking about Kevin Bacon here, but rather the need to rake the mast back three degrees from vertical. This tilt of the mast helps the sailing responsiveness and has been factored in to the exact mainsail shape (which is under construction in Maine right now). So we need to get this right. 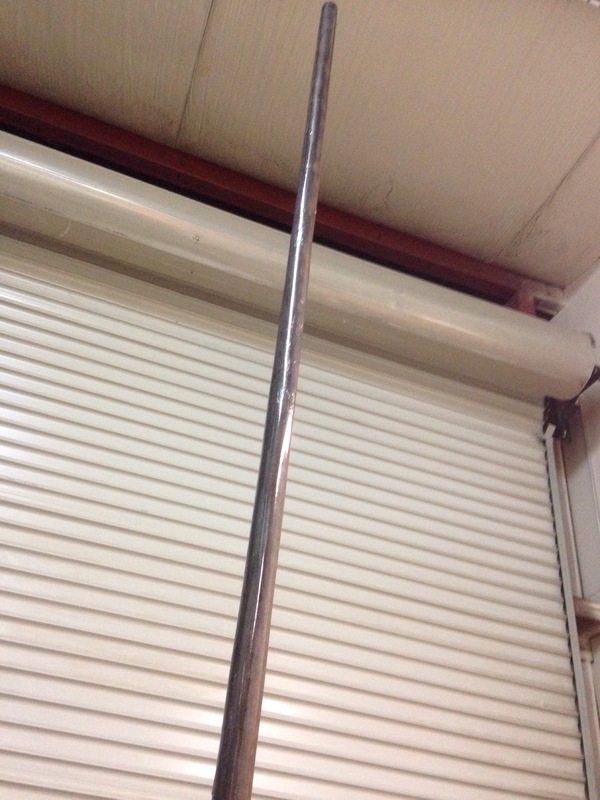 We need a hardwood wedge under the steel mast foot to create the angle. 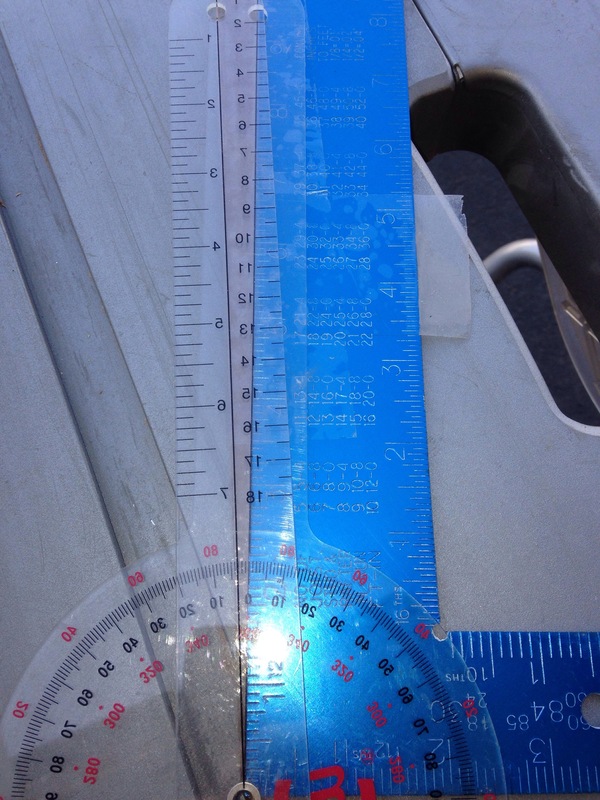 The wedge is greater than the 3 degrees because the deck slopes away from level. 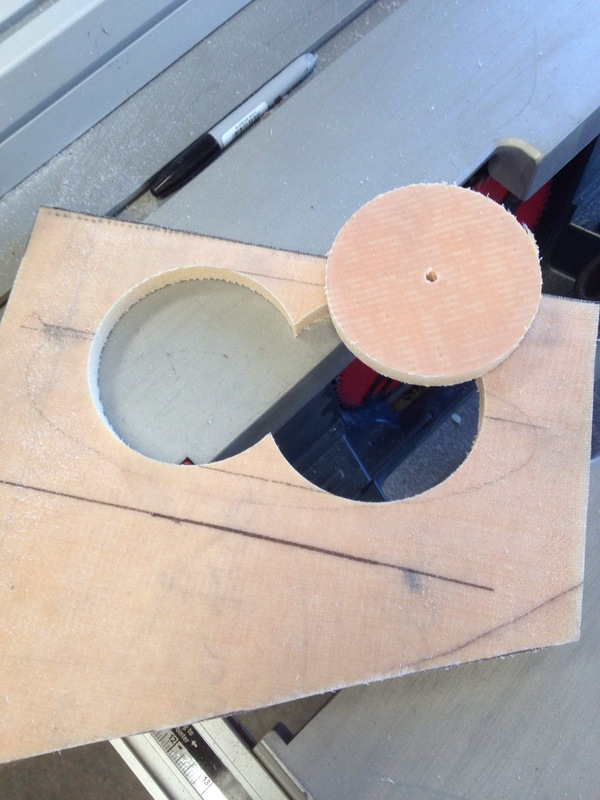 Based on math measures, here was the first cut. 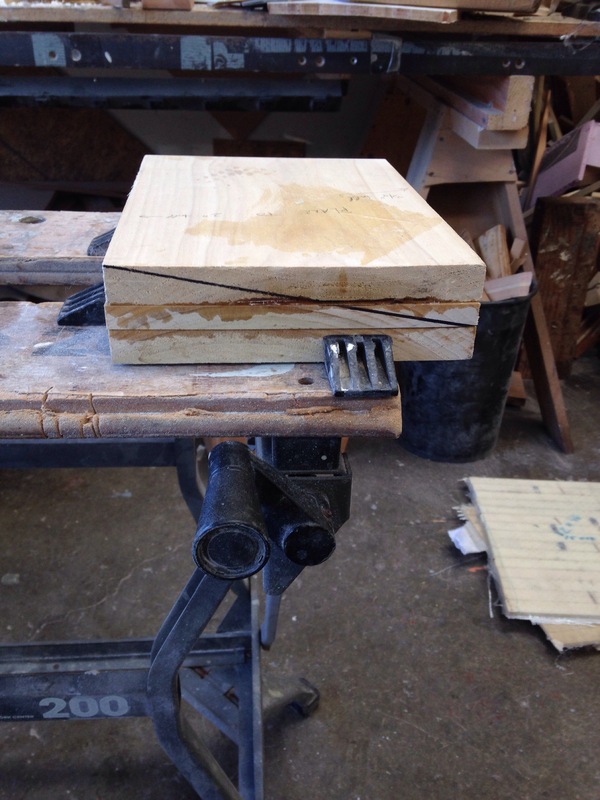 The alder hardwood block was planed to that black line but that yielded a 5 degree tilt, so some trial and error in hand shaping got it right. 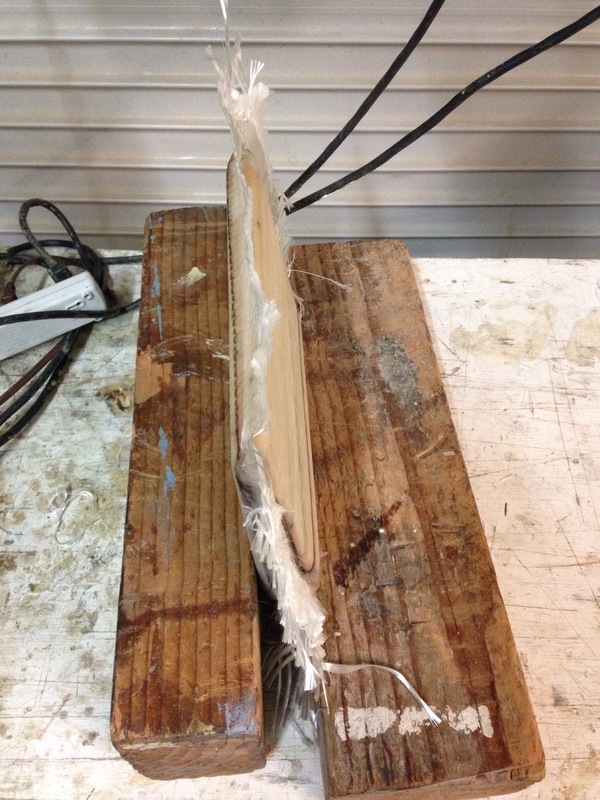 The wood wedge was then clad in two layers of 12oz BD fabric. 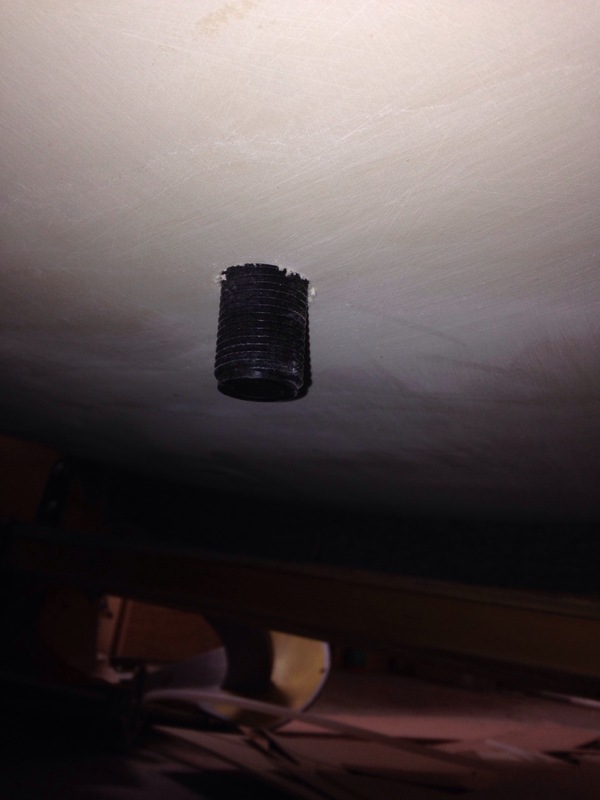 This piece was vacuum’d in an actual bag, not on the flat table. The bag pressing in on all sides if done right will put the excess glass right in the middle of each edge for an easy trimming job. This one went pretty well. 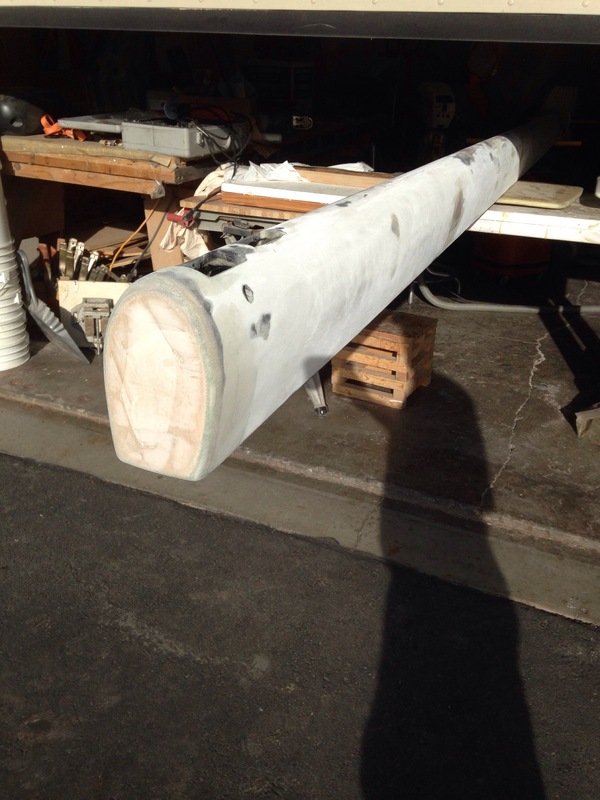 After some fairing putty, we tested it on deck today and hit right on a 3 degree rake at the mast foot. 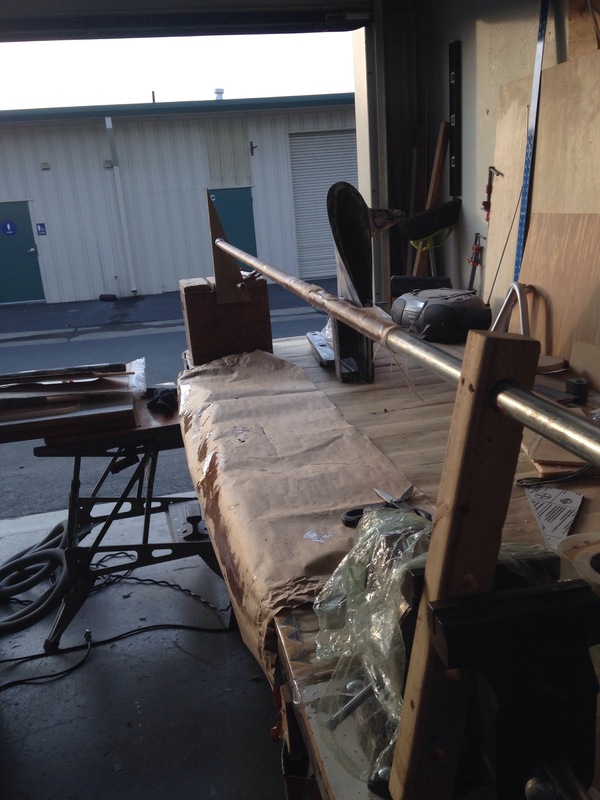 We talked today about adding a piece of steel atop the wood wedge with the mast base you see above welded to the new plate. That way the bolts holding the whole thing to the deck would pass through steel. As it stands now, the steel square has to be bolted to the wood wedge and the wedge then bolted to the deck. The steel square isn’t wide enough to span the dagger slot and be bolted directly to the deck. Anyone have experience or engineering perspective on this? 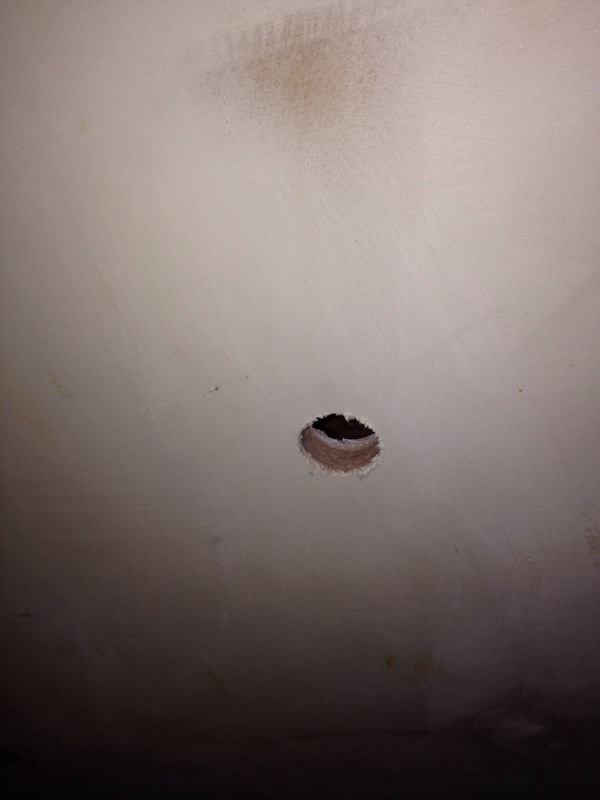 Today was spent on holes. First, a big one in the pocketbook, striking a good deal with Defender Industries. 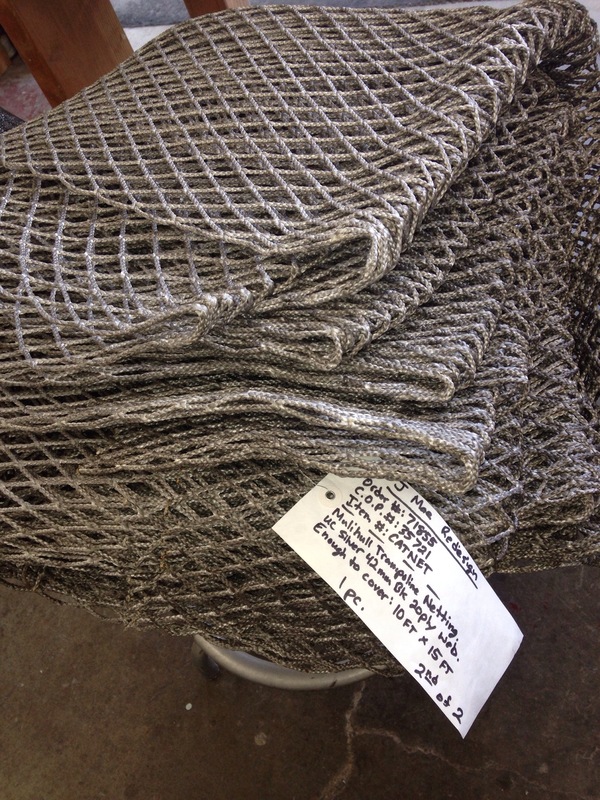 This order covers most of the big areas left – ports, plumbing, propane and remaining deck fittings. We did better here than Port Supply or other local sources. 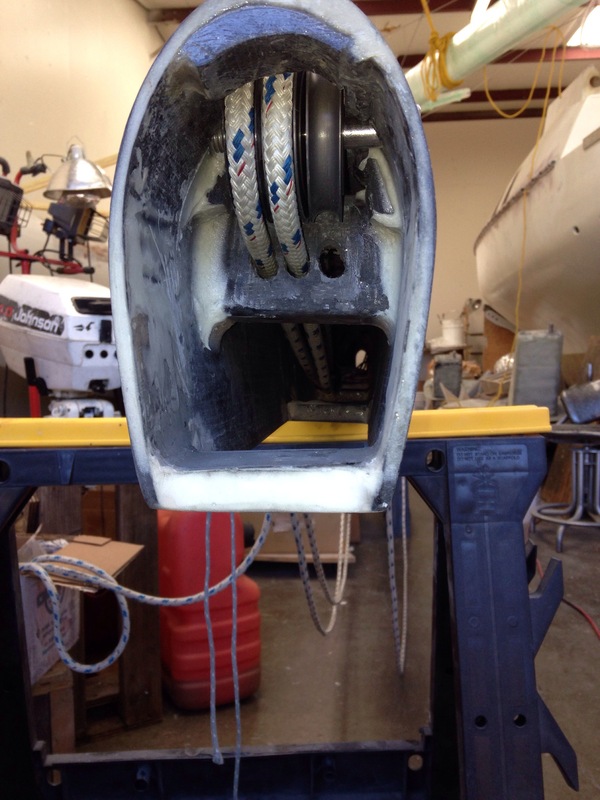 It’s been an incredibly rigorous and time consuming process to equip the boat, but the best part is going direct to manufacturers with the help of experts. We’re getting great gear from Lewmar, Colligo, Blue Sea electrical, New England Ropes and Garhauer. Thanks for your help guys! After giving Defender the Amex number, we tackled the first through hulls. 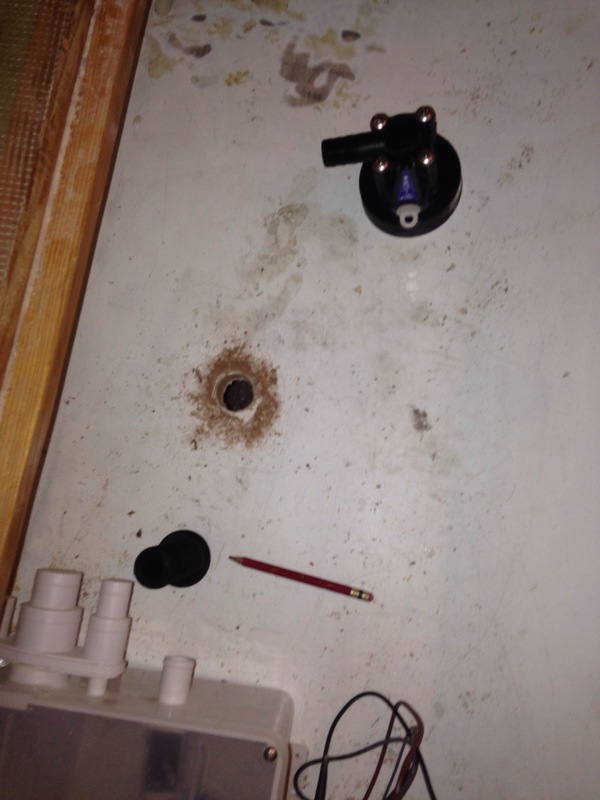 We’ve made plumbing decisions such that there’s only one below-the-waterline plumbing hole (for a seawater manifold) and one for the depth sounder / speed sensor. They are going in tandem placement, just starboard of the daggerboard. 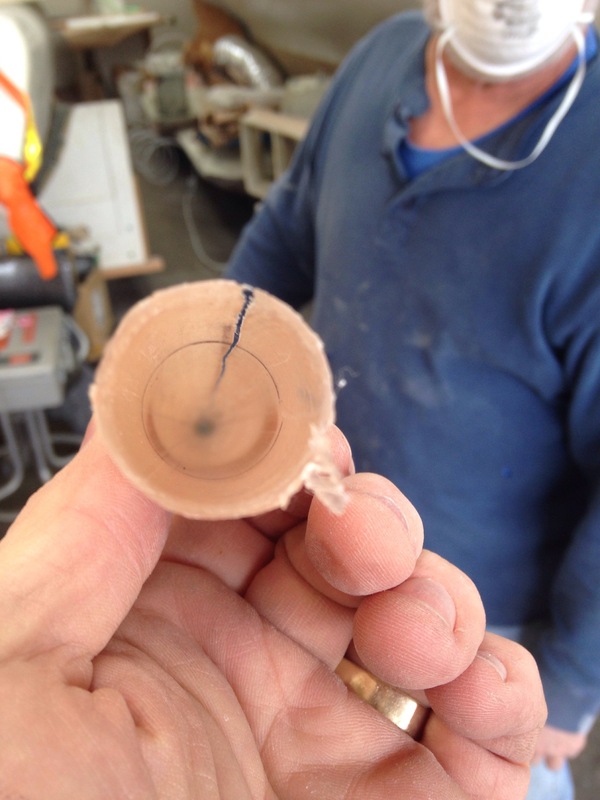 Here’s the thruhull inserted upside down to check the depth; we needed to cut off about a half inch of threads. 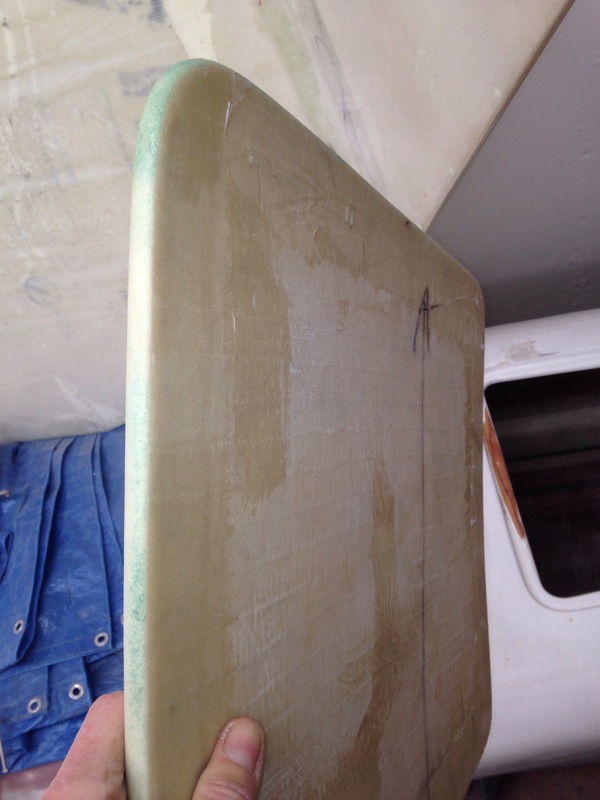 In the second photo you can also see the Kevlar outer skin in the ‘shadow’ of fairing compound – that’s about two feet wide from the bow back towards the stern. 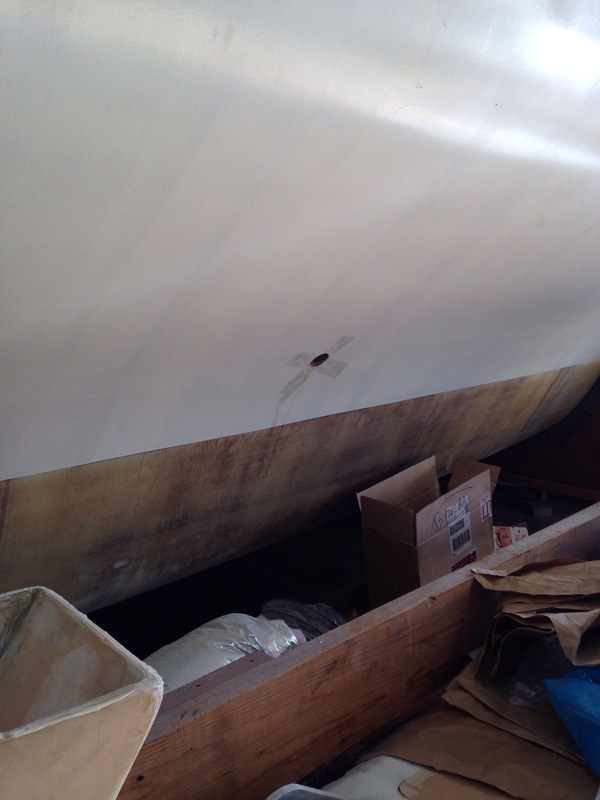 Further up the hull side, over on port, is the first above the waterline thruhull. 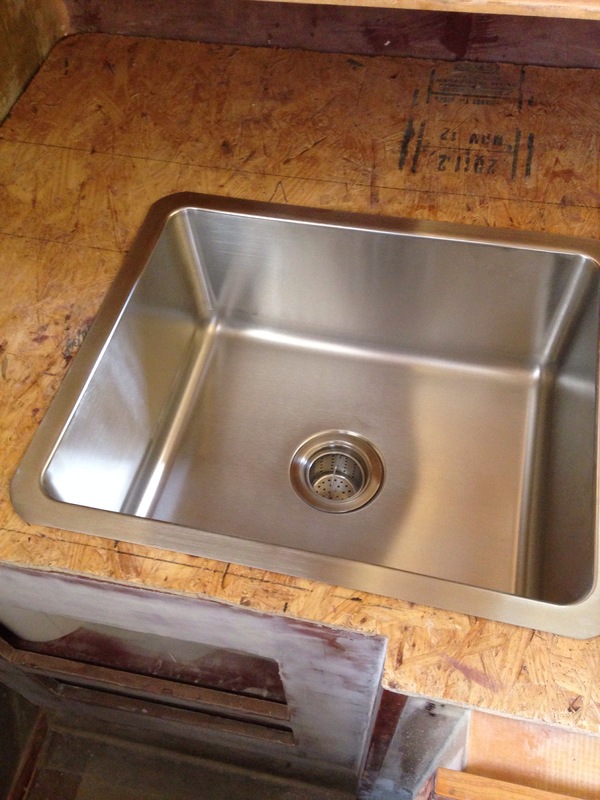 This one is the galley sink. All of these holes are being cut too big and then re-edged with epoxy/cabosil putty. 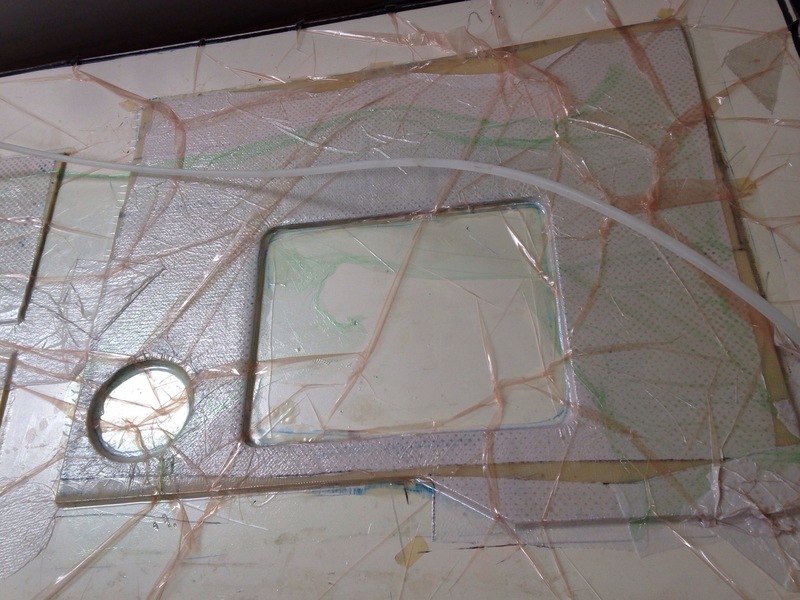 We’ll also add back some glass on the outside and fair it in. 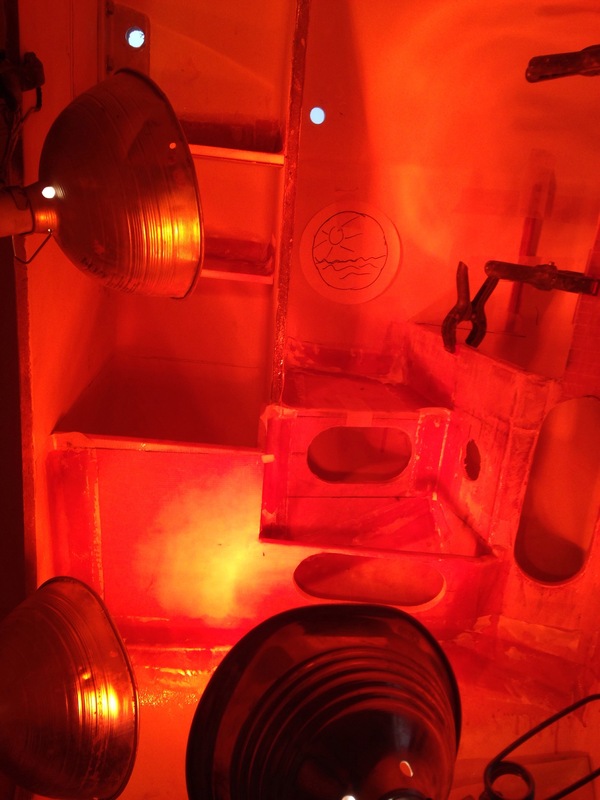 I decided to do this instead of trying to dig out cedar core in between the original inner and outer glass layers. 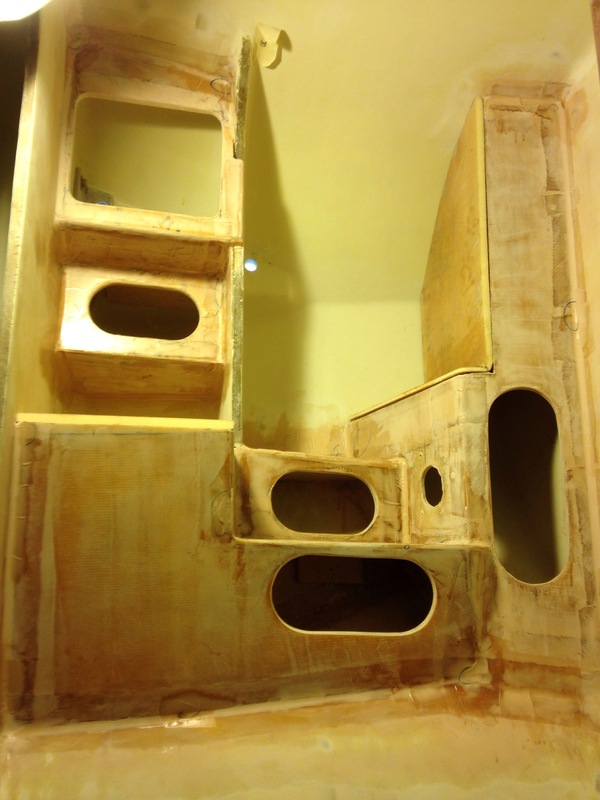 We’ll see more of the thru hulls during the post-painting fit out. The main cabin is getting final furniture building. 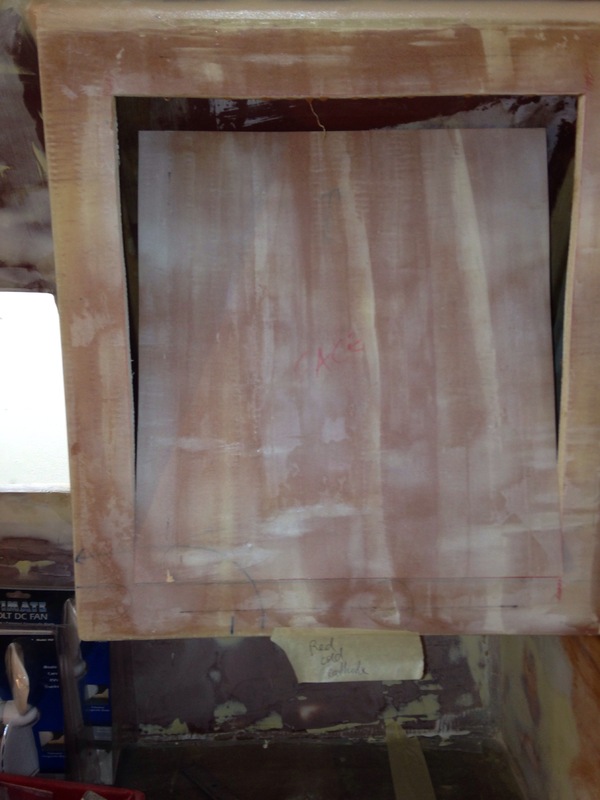 Here’s a cardboard mockup of a backrest cabinet for the seating position on the starboard day bunk. The base isn’t very wide and the hull curves in steeply, so it’s a tough balance to preserve lying down comfort yet make the backrest functional for sitting up. It doesn’t extend to the bulkhead in the left of the photo because that’s the most comfortable spot, leaning back on that locker wall with your feet up on the bunk. 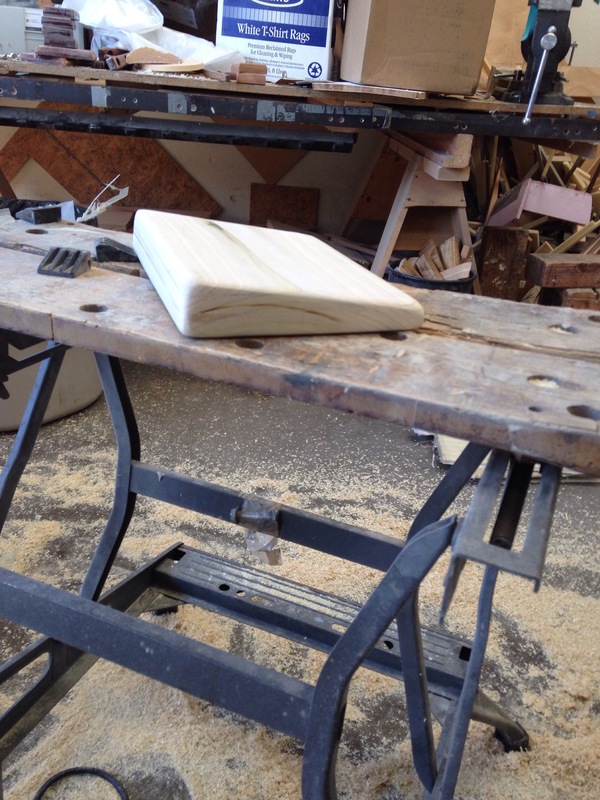 Thanks Charlie for the idea to make the backrest swing up to reveal a small storage cabinet. 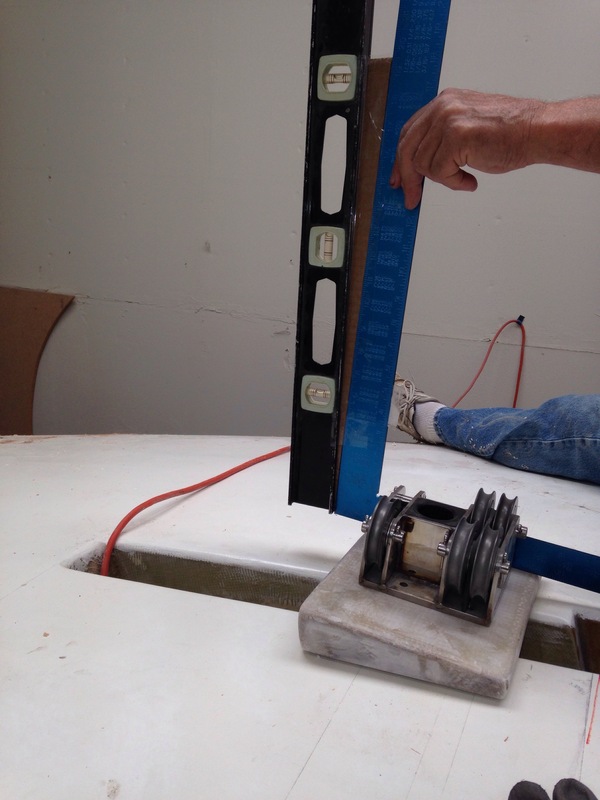 During the cabin buildout we think ahead to wiring – here the chart table gets surgery in the form of a big 4″ series of holes to route cables between the batteries and the circuit breaker panel. This stuff will get clean face plates screwed on to hide the wires after installation. 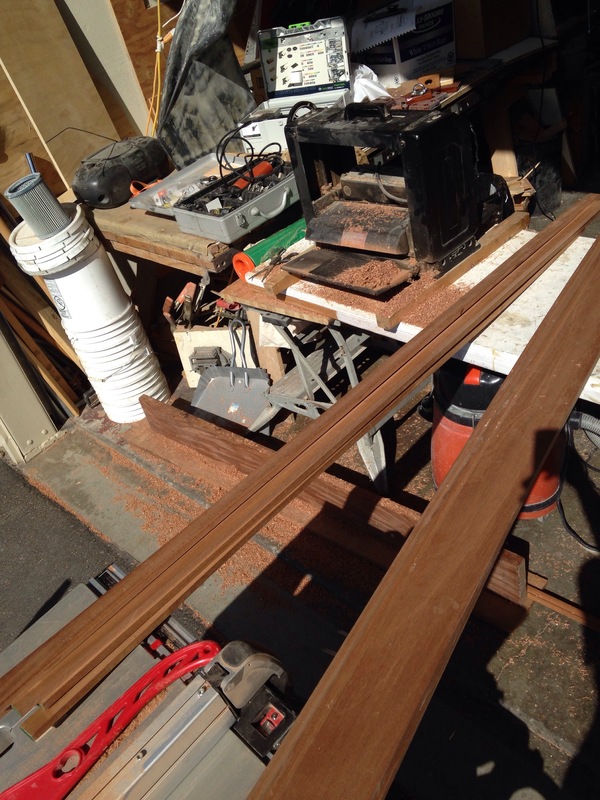 And we’re spreading mahogany dust all over the driveway as the portable mill rips and planes repurposed baseboards and casings in to lovely boat interior trim. 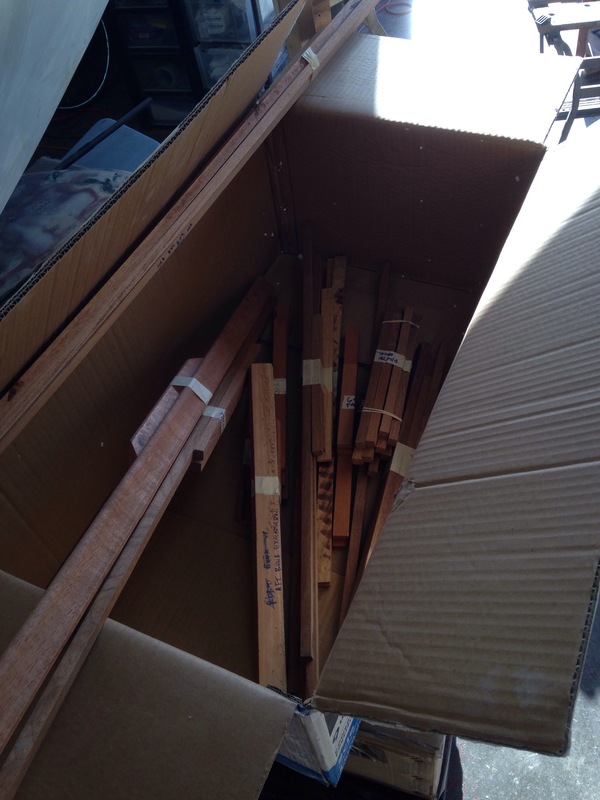 The boards on the right end up as excess stock when cabinetry clients change their minds. Good neighbors to have during this build! Well the boat shop has been busy but there hasn’t been time to post here. 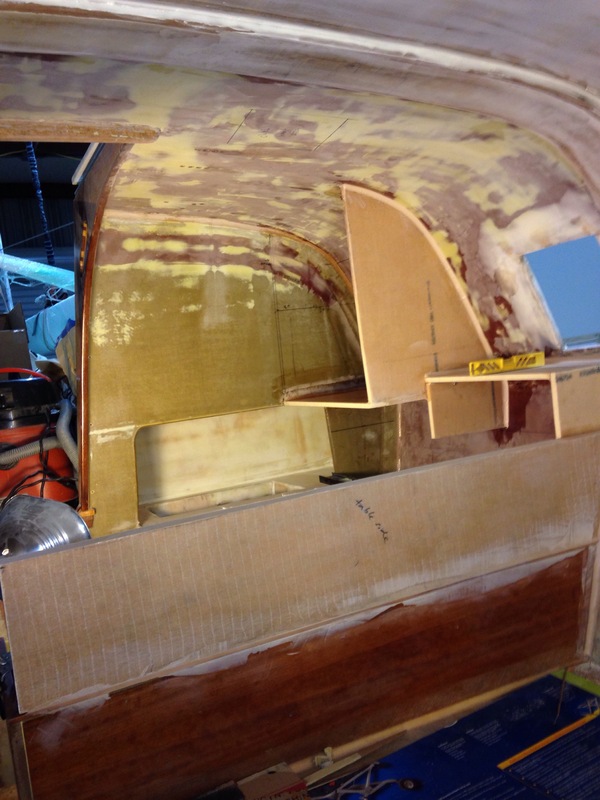 The work has moved back to the interior while some final steering and anchoring parts were ordered. I met with a marine electrics specialist to discuss wiring the boat, and agreed to have Joe create a systems schematic as our blueprint. 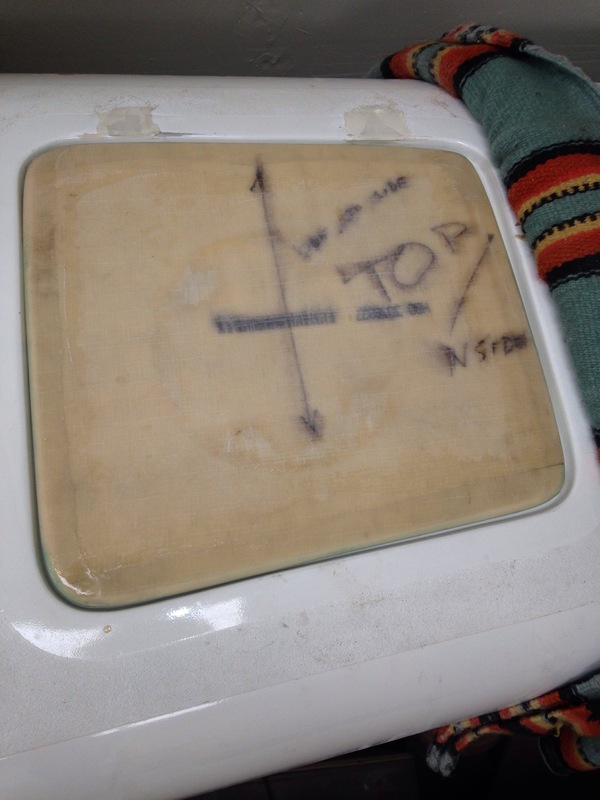 While he prepares the specs and develops the parts list, we’re back at the boat planning the cable runs, panel location and tricks to conceal all the wires while also keeping everything trouble-shooting accessible. 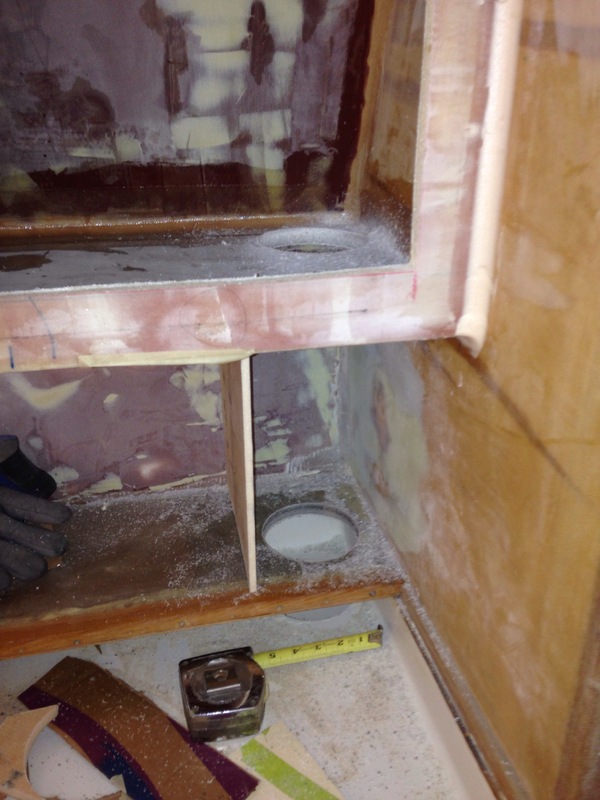 Captain Holway will be very happy when he sees how the electrical access turns out. 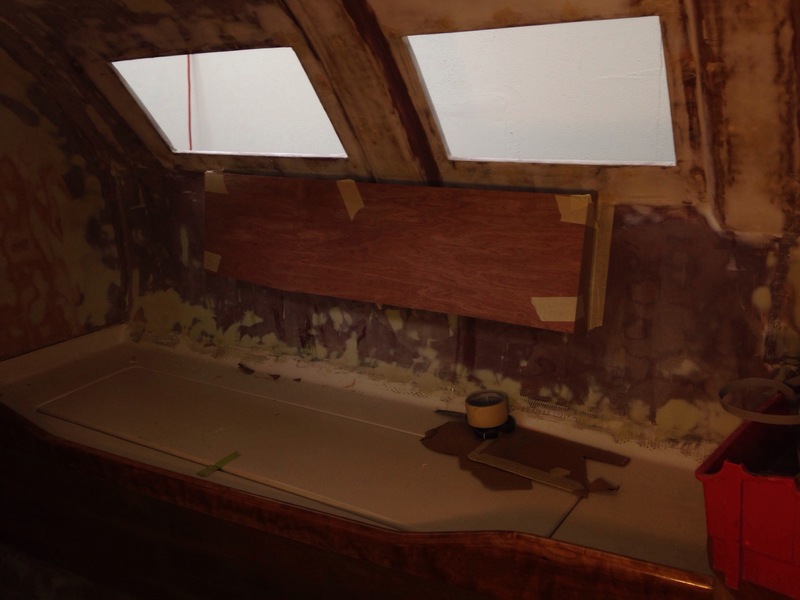 After the head, we moved on to the dressing/wardrobe cabinets and now the nav station and galley. 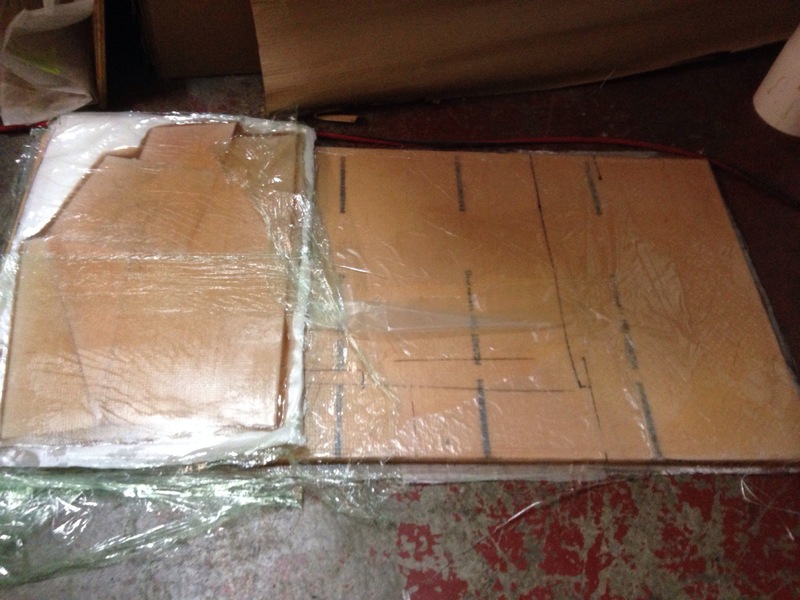 All done first in cardboard as templates for the foam core fiberglass panels. 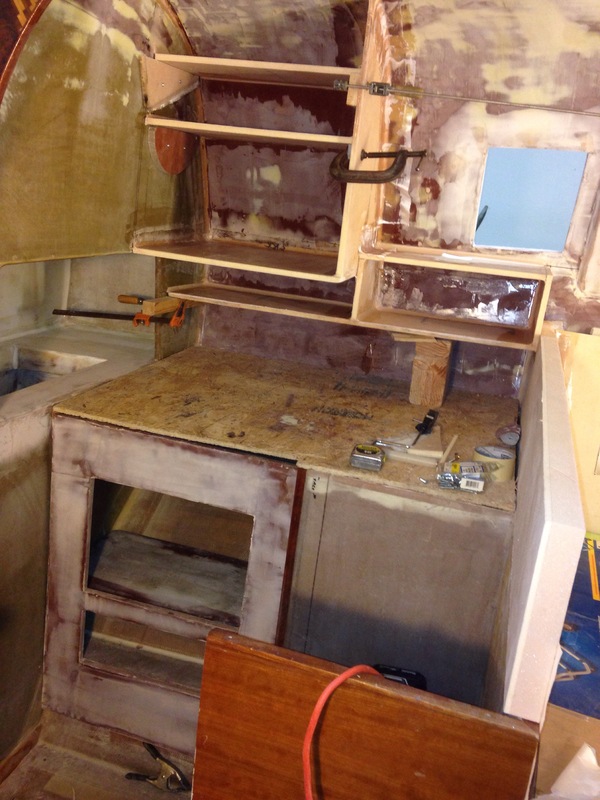 Here’s some seat back storage in the dinette, looking aft towards the galley. 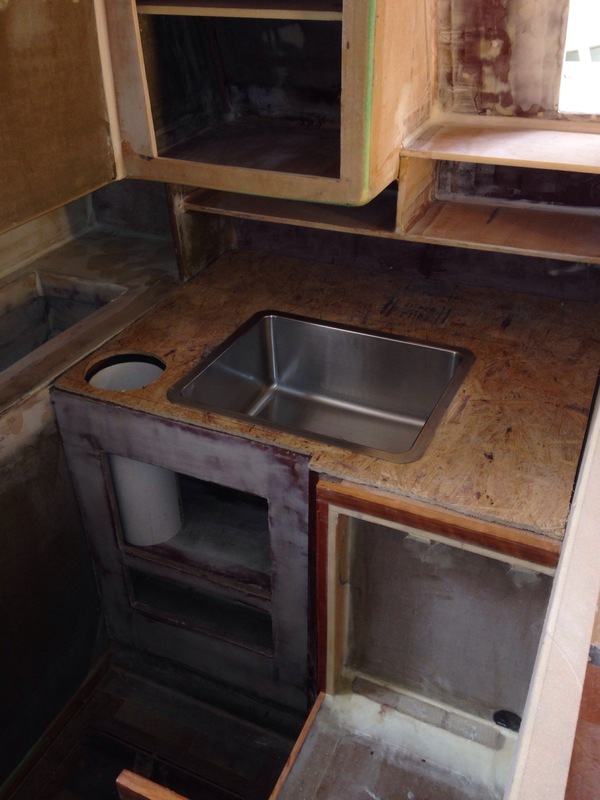 Then panning left; the light tan bar in the middle serves as the backsplash to the galley counter and stove. 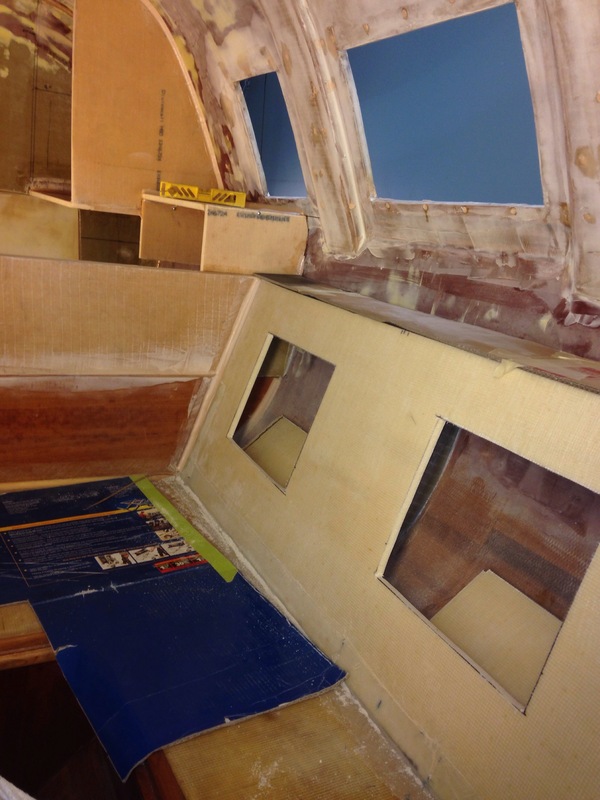 The galley shelves all got bonded to the hull walls tonight. The big hole where you see the orange cord disappearing is the space for the stove/oven unit. 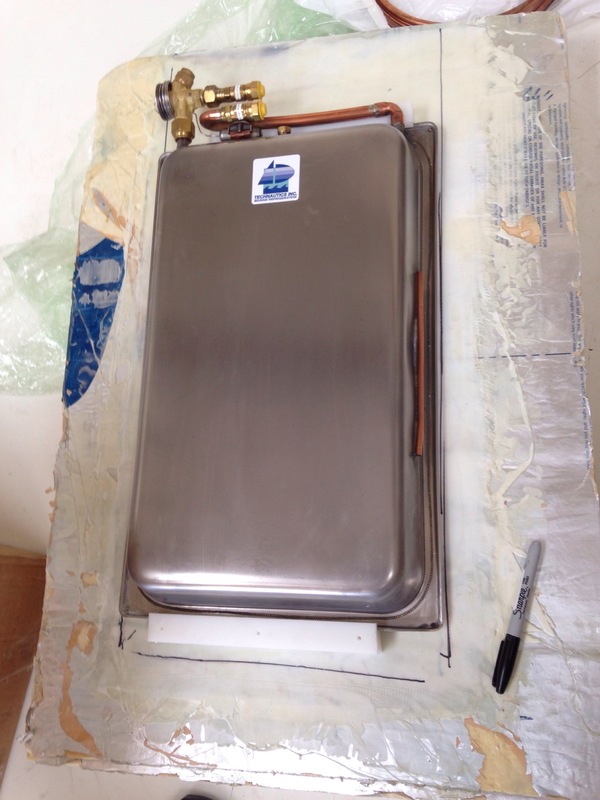 The freezer box is now faired in with its extra cubic foot extension, and now awaits paint before final install of the cold plate and refrigerant/compressor tubes. This thing is a tight fit – the black pen lines on the sides are where the side walls of the freezer box meet this back panel. We had this box dimension when shopping at the boat show, but this got pretty snug! Worked wrapped at 11pm tonight with a push to get the radio / electronics cabinet installed above the navigation desk. 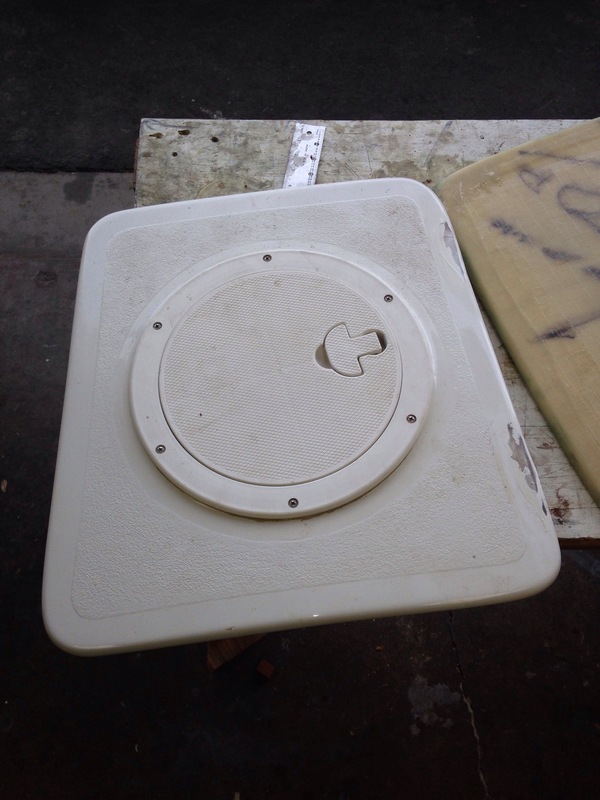 The large cut-out is to make this face panel hinged for easy access to wiring and installation of various nav and communications components. There’s a foul weather gear locker to the right, a handheld electronics cubby above that, and a sloping cabinet below the desk for charts. 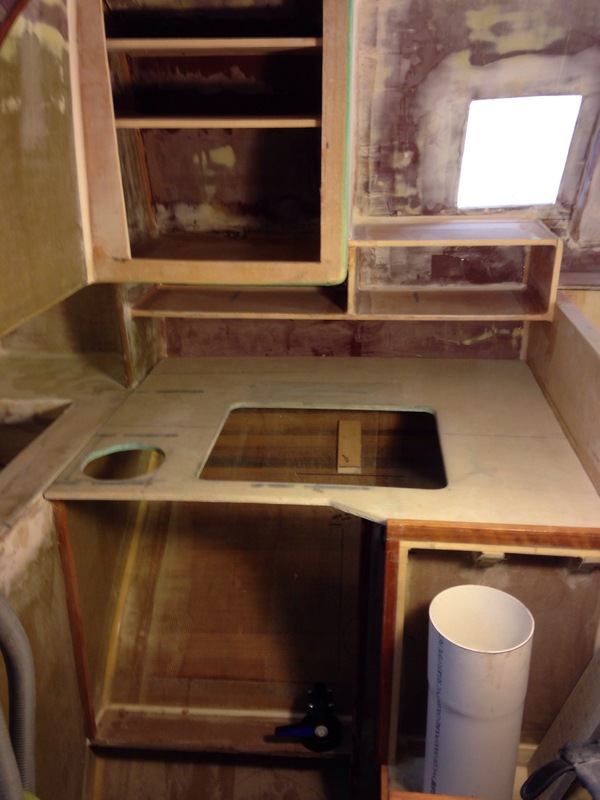 The desk’s wood trim was roughed in with fir, but needs some skilled woodworking to make this be a proper focal point in the boat’s fit & finish. Any fancy wood inlay ideas for the desktop out there? 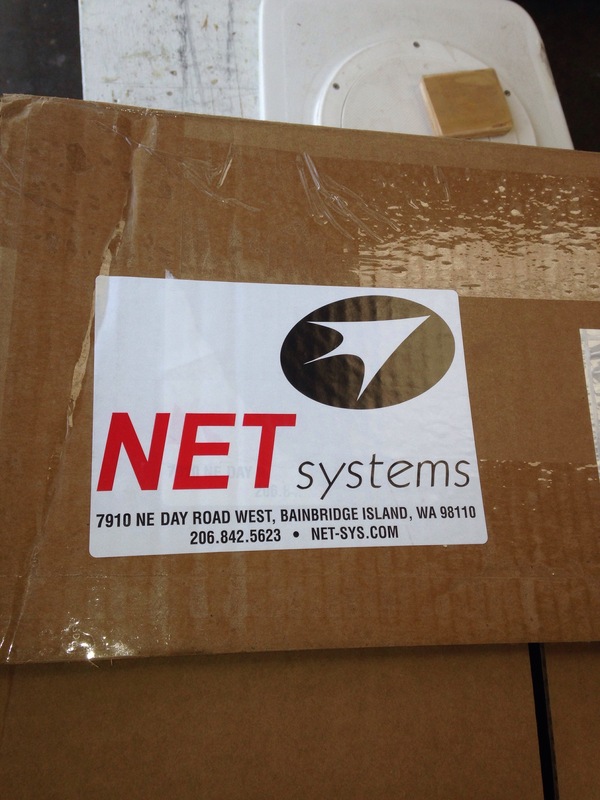 The first shipment of standing rigging parts came in from Colligo Marine. 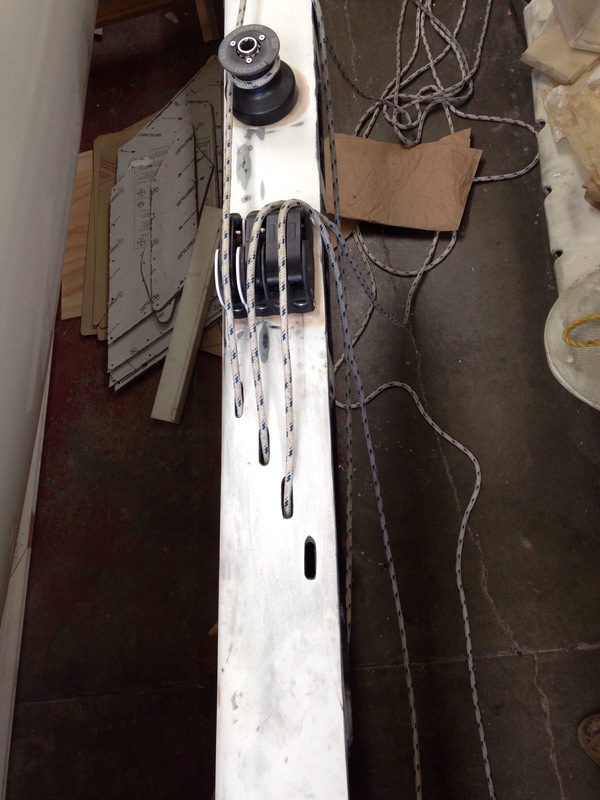 These are the lower anchors for the cap shrouds – 2 of the 3 big lines that hold the mast up. We needed to have these parts in hand to properly size the “chainplates” to build in to the outer float hulls, receiving these anchors. These things used to be big steel plates bolted through the hull with huge chains attached to them. Instead, we’ll make them in carbon fiber, light and strong. 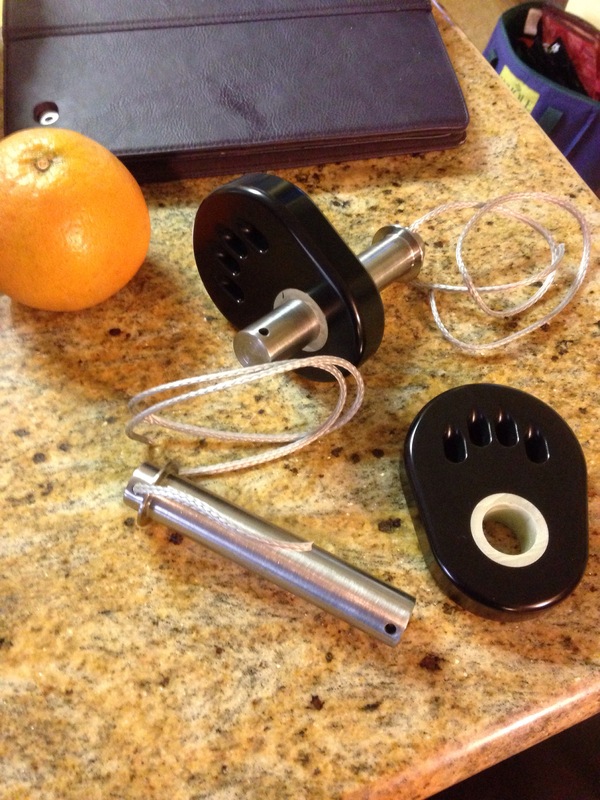 Grapefruit in photo gives some scale; these parts are at least 3x the size of similar parts on the F27. Colligo’s work here is beautiful. 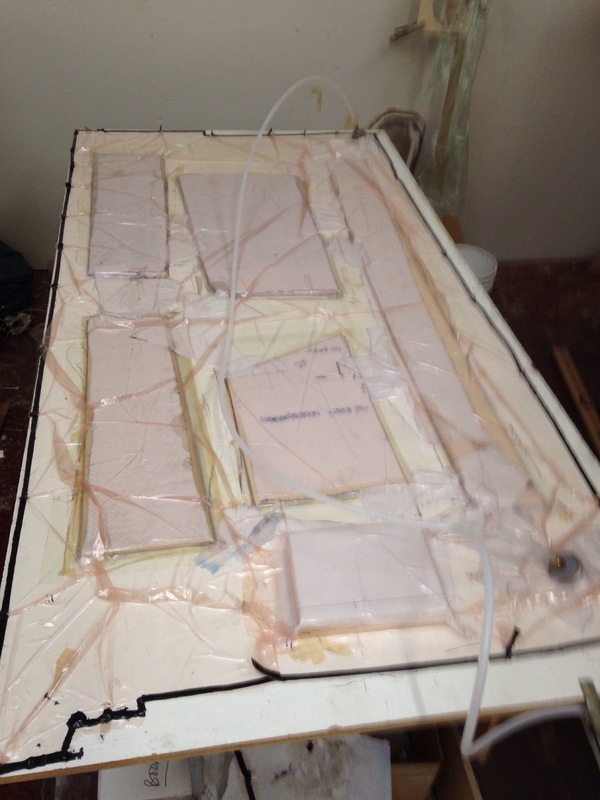 The head compartment cabinets are all faired in, ready for paint. 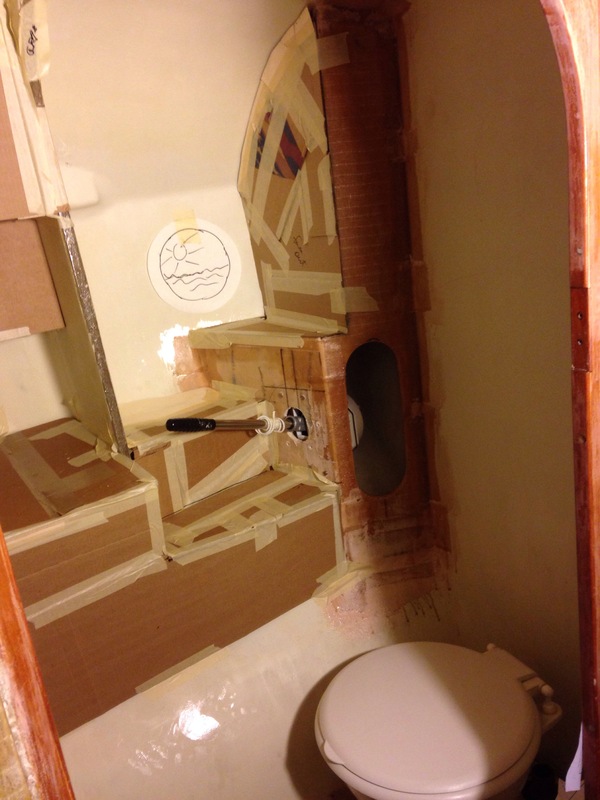 Need to make a couple of doors, and the L shaped part in the right of the photo is a removable section for easy access to the toilet plumbing. 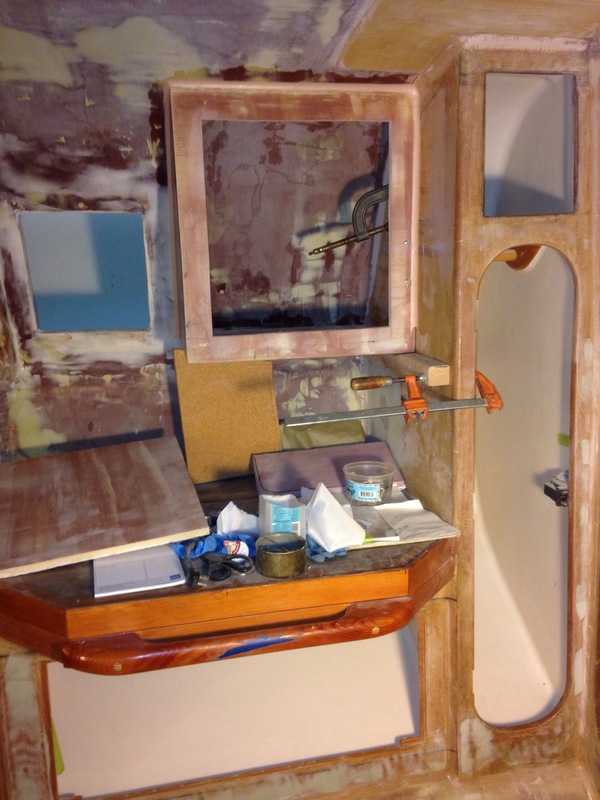 Now we’re repeating the process of cardboard mockups for the dressing / clothing cabinets outside the head area, and the galley cabs. Jeanne came down to the boat and we mapped it all out yesterday. Down on the workbench all of the new steering components got completed and faired out for paint. Just need to get a couple of bushings in then we can mount it all up and show you. 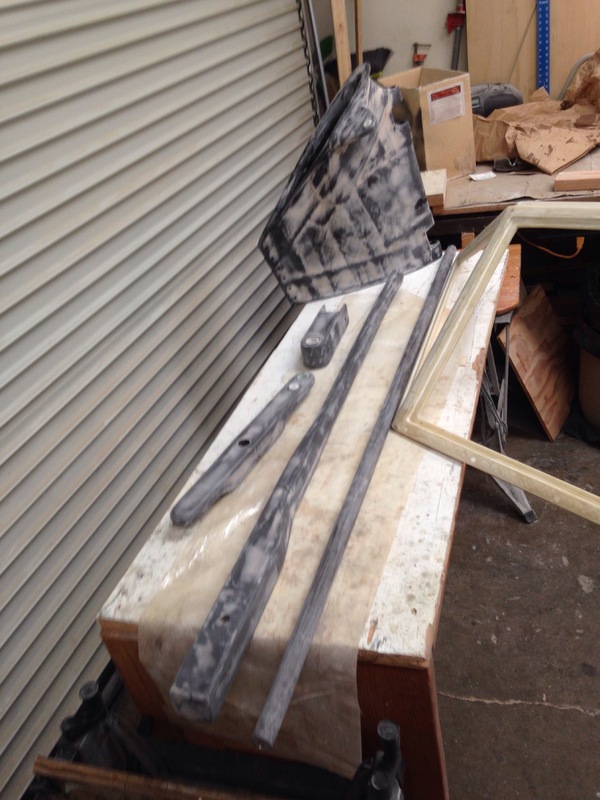 And that’s the edge of the windshield in that photo, also FINALLY ready for paint. So much fussy detail sanding and fairing on that intricate big part, and it was frustrating me so badly that I set it aside for months until Charlie came along with a fresh attitude and tamed the tiger. Thanks man! 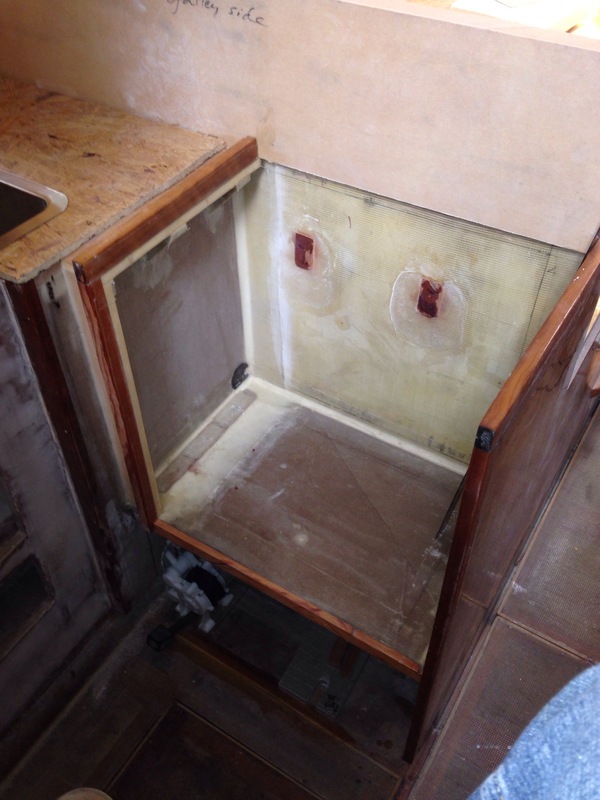 A short update tonight, just to let you know the head compartment cabinets are cooking along just fine. Three of the 14 panels still need to be bonded in. If the wine bottle stays in the cupboard during dinner, that work will get completed tonight. Eager to attack the galley build next! Since we’re saving time making the bow sprit from aluminum stock, that eliminated the anticipated fun of trying to make a carbon fiber tube. 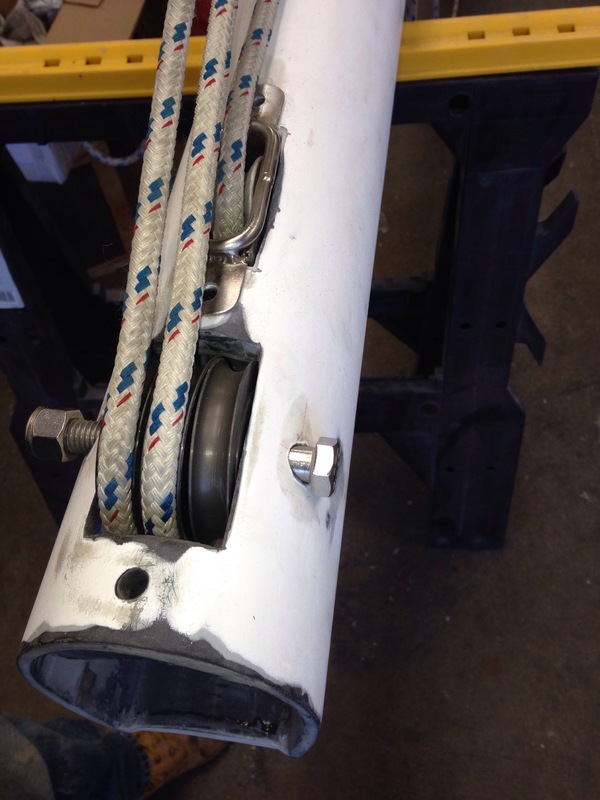 But we found an outlet – the six foot steering connection rod you’ll see soon between the new tiller pivot point and the rudder cassette. 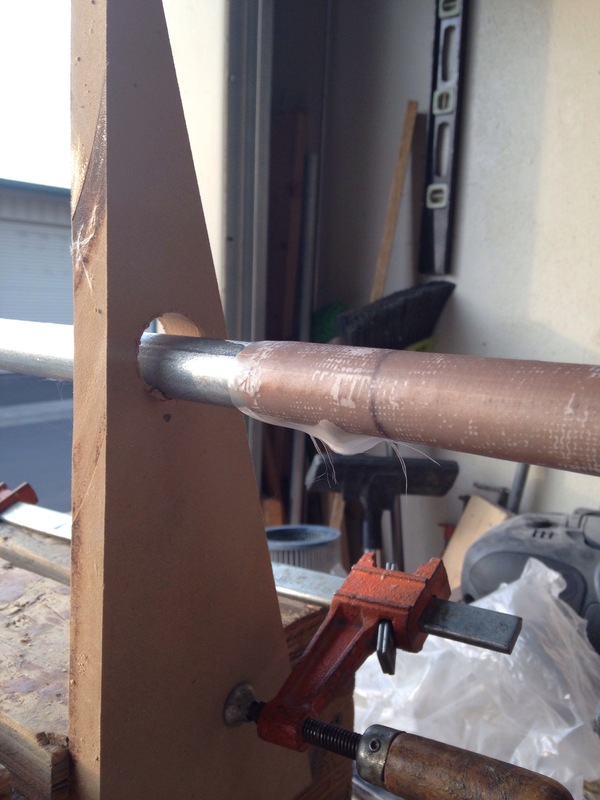 I don’t have much success getting all-around-glassed parts off the mold or mandrel, So thought we tried the method where you start with a thin fiberglass layer and make a lengthwise slit to get the new tube off the mandrel. 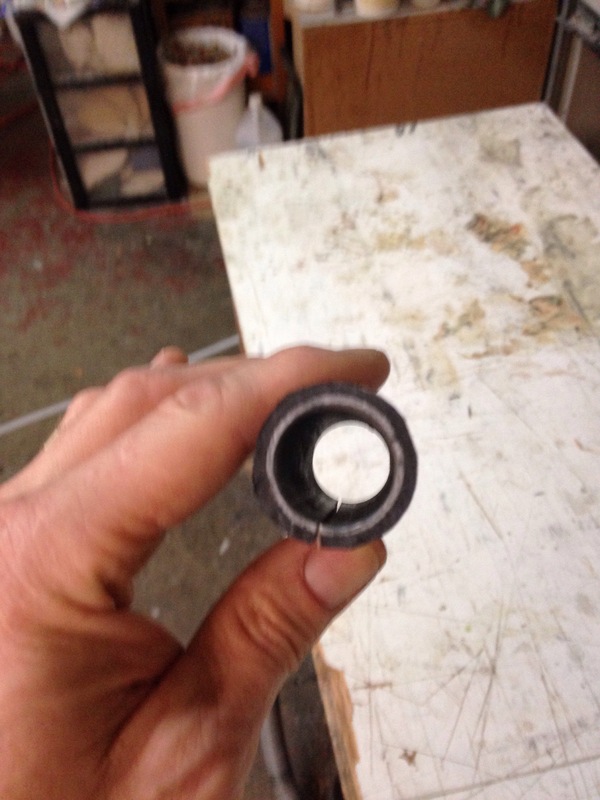 Once this thin tube was free, we rewaxed the mandrel (which was a piece of metal electrical conduit) and slid the tube back on with the idea that the finished carbon layers would not get stuck to the mandrel. Since we’re “free styling” on this project and it’s the primary steering linkage (a REALLY important part) it seemed that five wraps around with 9oz unidirectional carbon was prudent. Well that many layers of hot epoxy plus the vacuum bag smashing it in and no PVA mold release, etc meant no way was that finished piece sliding off the mandrel. So we made another slit and went back and resealed it afterwards. The result is a pretty thick tube that is comforting-ly stiff when you lean hard on it with no flexing. The only metal in the steering system will be stainless steel nuts and ball joints embedded in each end of this tube, plus the bolts to connect pieces. 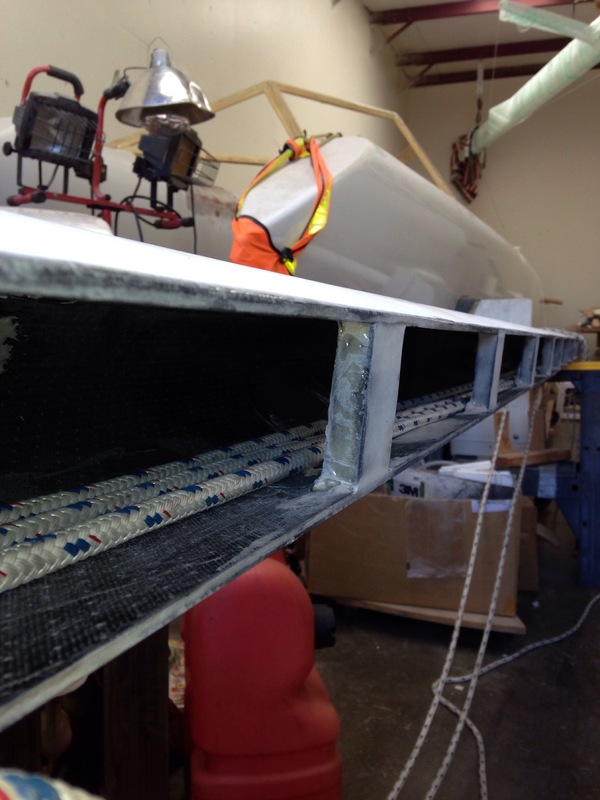 Everything is built now but the rudder bearing I bought isn’t right and needs to be replaced. So stay tuned for the completion soon on that project. 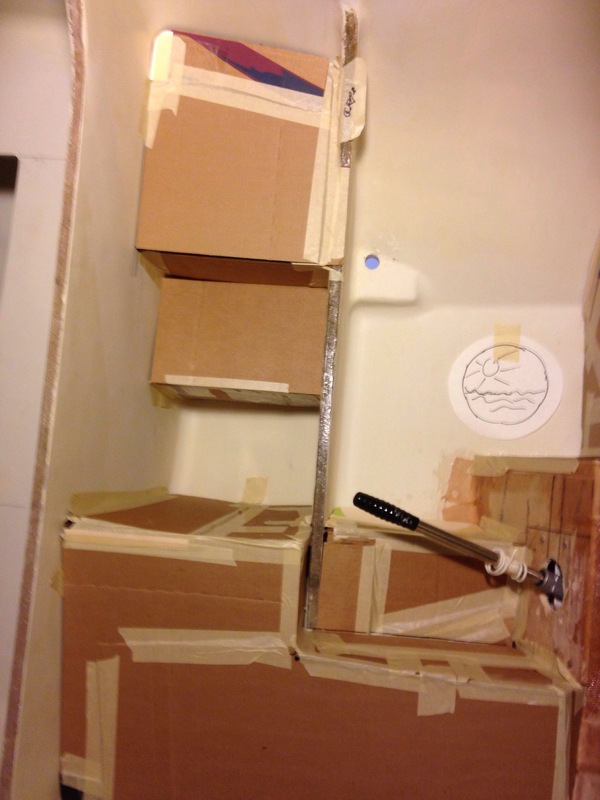 And now to cardboard… It’s not the most elegant way to dream up bathroom cabinets but it works for us. 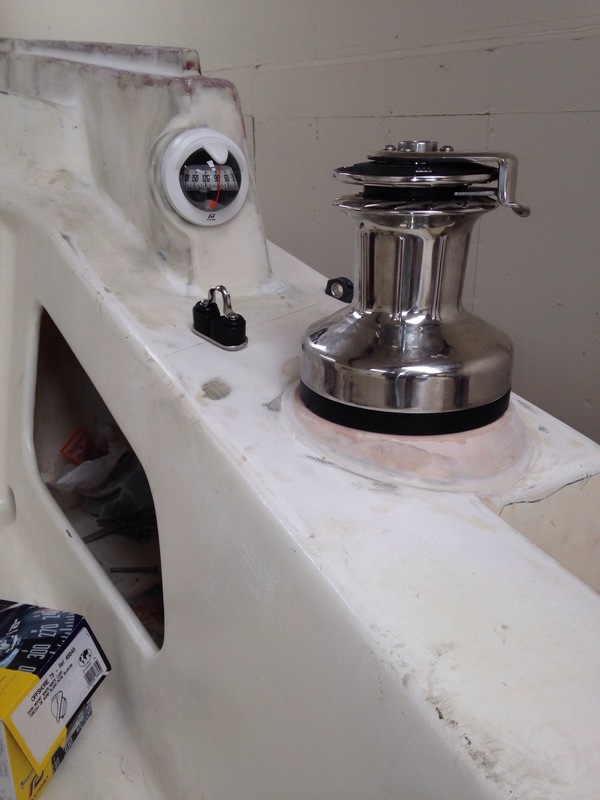 The trick here was designing around the hand pump for the Lavac head and the big mounting brackets where the port side forward beam bolts to the center hull. If you’re wondering, it takes six quarters of NFL championship games to cut, recut and generally fiddle with angles to get that mockup done. (poor Packers!) 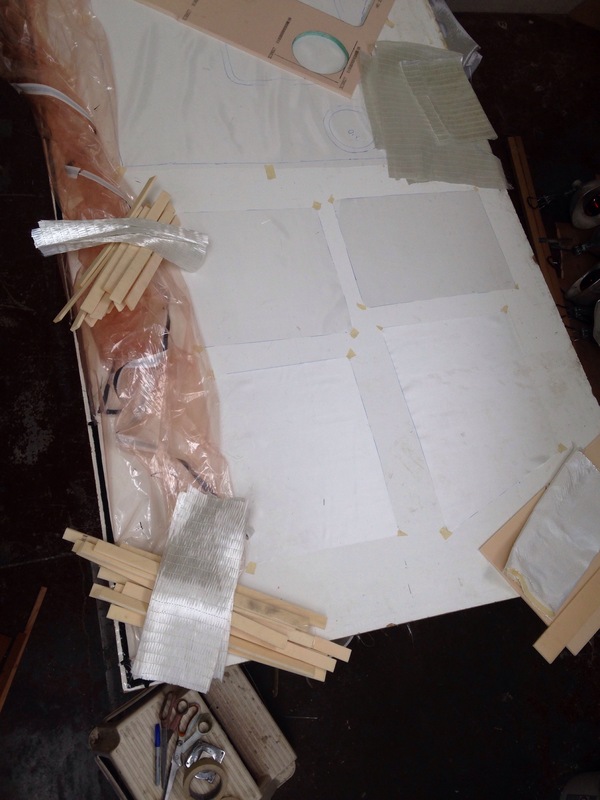 You’re seeing 14 panels that need to be made, adding up to roughly 4′ x 6′ of surface area. 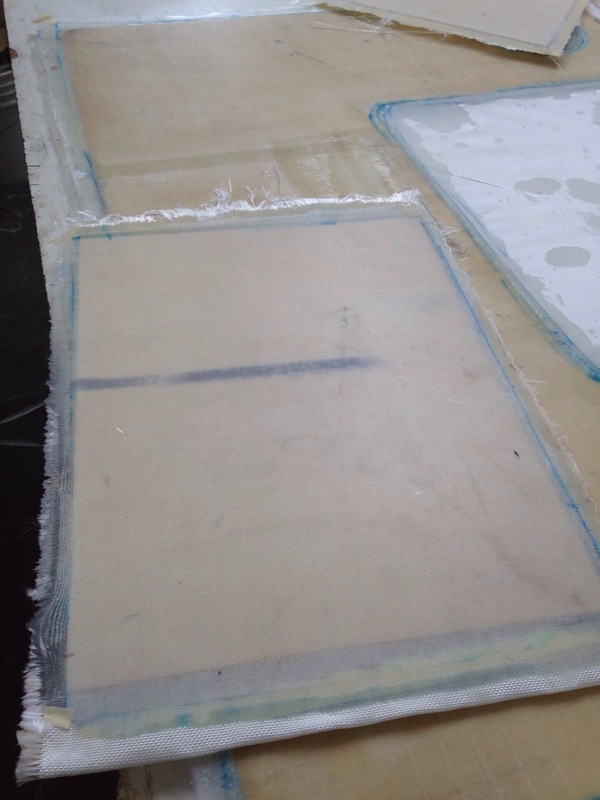 Large sheets of double sided laminations were curing on the vac bag table during the two football games. 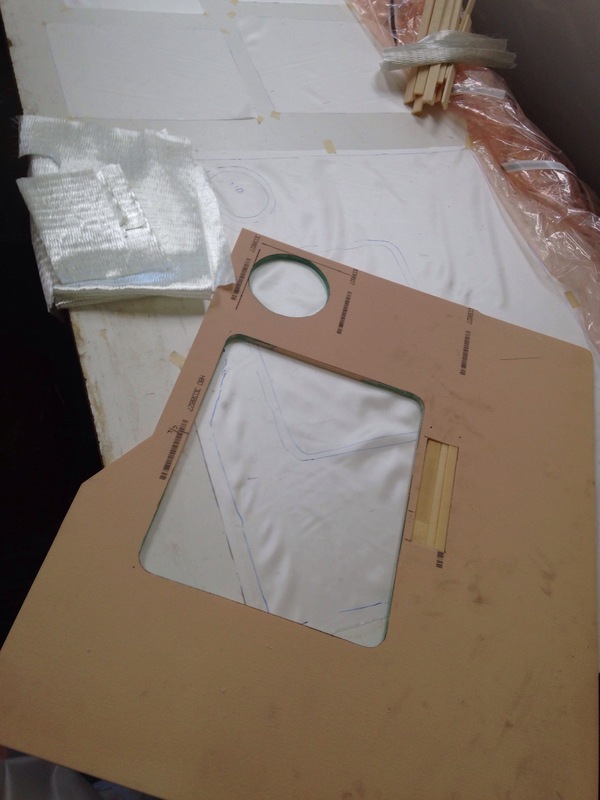 And today began the cutting and fitting, like solving a big jigsaw puzzle. 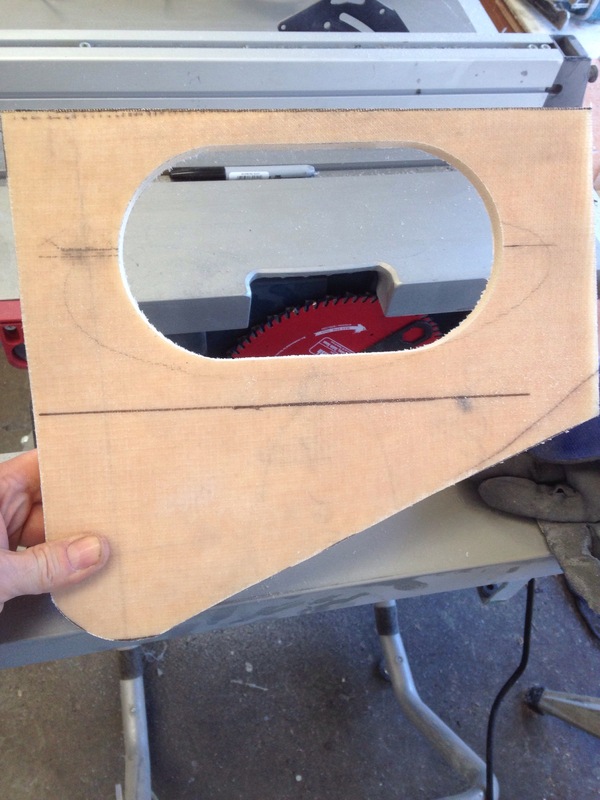 One nice trick for cabinet face openings is lining up center points of 4.5″ hole-saw cuts and connecting the arcs. 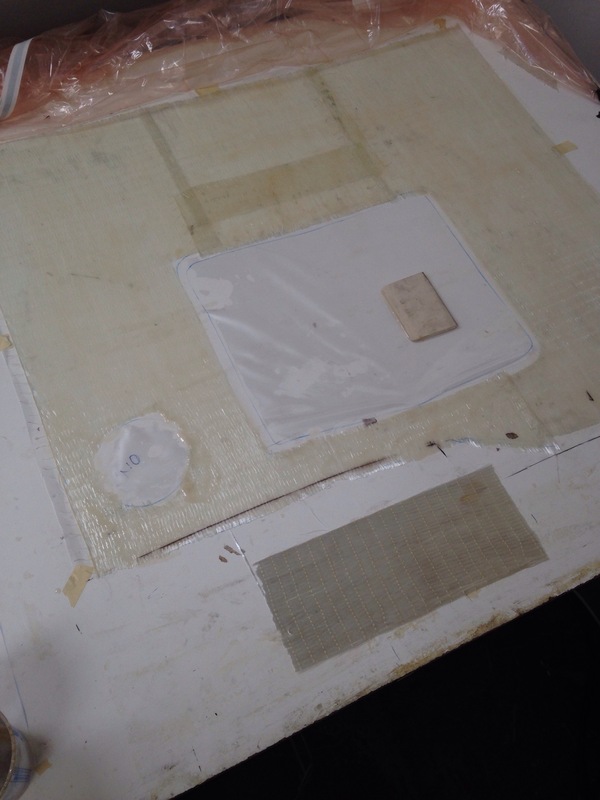 It’ll probably take a few days to get this all built out, as there are many intermediate curing steps on adjoining all the panels.